I have never used the services of our local Family Crisis Society, and I am truly grateful to have never required them. I do, however, have some experience with them, and I know their value in this community, because they touched the lives of some people very close to me. A few years ago I knew a family here that was enduring some deep and painful times. There was a lot of conflict, and caught in the middle were the children, children of whom I was and am deeply fond. On occasion the children, when things were bad at home, would end up with me for a few days, and I was always glad to have them, although it expanded our little family dramatically. I knew, though, that the situation at home could not continue forever, and so one day I was not surprised to learn that the mom had decided to leave the dad, and, having nowhere else to go, had taken the children and were now residing in the shelter the Fort McMurray Family Crisis Society provides. That it was a hard and painful decision there is no doubt. It was a scary time for them, I think, and an uncertain one as the world around them changed so rapidly, and they found themselves navigating very new territory. I was deeply grateful that the Family Crisis Society was there to guide them through it, and I can now report that they moved on to another community where they are happy, and thriving, and whole, and recovered from a traumatic time. And they did so because there was a social profit organization there to see them all through it, an organization that is so very vital in this community. For that reason the local Family Crisis Society has always been of tremendous importance to me, because I witnessed first hand the work they do and how they changed the lives and outlooks of some people who are very important to me. 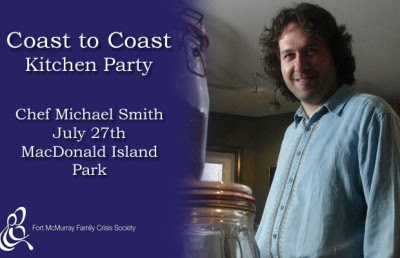 For that reason it was my genuine pleasure to attend the Coast to Coast Kitchen Party last night - to eat great food, to meet Chef Michael Smith, to enjoy a great friendly atmosphere - but most of all to celebrate and raise funds for the Fort McMurray Family Crisis Society and the work they do. Last night I arrived at MacDonald Island Park for the event, but I had the advantage of knowing the work that had gone into this beforehand. You see I walk right past the curling rink surface every day when I arrive at work, and for days I had been watching as it transformed from the normal concrete into a landscaped map of Canada, with sod and trees and mulch and plants. I had watched the enormous Canadian flag be hung (the largest Canadian flag in western Canada, apparently), and I had watched with awe when Chef Michael Smith arrived and flung himself into the preparations. He had no idea I was watching, but I was, witnessing a famous Canadian chef as he carried boxes and bags and worked right alongside all the others preparing for the event. Perhaps some chefs are divas, appearing at the last moment for their moment to shine, but not Chef Michael, who I saw work tirelessly to get ready for the event. I was impressed before I even heard the man speak, and last night, during the event, I was delighted to listen as he choked up while discussing his pride in being Canadian. I saw a man who is authentic and sincere and genuine, and it was a pleasure to listen to him speak - and oh yeah, to eat his food. It wasn't just his food, though, but food from chefs from all across the country, representing every province. There was food, so much food that even today I have a bit of a food-coma going on. I started with the strategy of eating coast to coast, going from east to west, but quickly abandoned it as a poor strategy when I realized I would never make it alive. I instead focused on what I really wanted to try, and soon found myself eating salmon from BC (prepare by my dear friend and Sawridge chef Ken Bowie) and the delectable reindeer from the NWT (I am afraid I will have to explain to the Intrepid Junior Blogger that I ate Rudolph, and while I felt shame I felt zero regret as he was, in a word, delicious). By the time the desserts arrived I was so desperately stuffed, but I couldn't resist the peach almond tart and the raisin bread pudding, a pudding served warm and with a rum sauce that pretty much made me cry tears of joy (and anguish as my belly protested). The food was glorious, the company at my table (complete strangers, but kind ones) good, and the atmosphere festive and very kitchen party indeed. There were so many entertaining moments, most of them involving Chef Michael as he did things like teaching Tim Reid, COO at MacDonald Island Park, how to take the cork off a champagne bottle with a cleaver (this looked ridiculously dangerous but went much smoother than I feared), and organizing a little whipped-cream-making-competition using audience participants to produce the whipped cream for the desserts by shaking the cream in jam jars (I must admit my table deferred from using the whipped cream produced as we were a bit dubious about the efforts of the person from our table who took part, and instead opted for the other sauces). There was a live auction, too, with super-auctioneer Ross Jacobs in charge, and one that raised a tremendous amount of money, including two trips to PEI to spend time with Chef Michael. Each trip went for a colossal $30,000, but money well spent I suspect for an adventure that will live forever in the memories of those who go. And speaking of Chef Michael - well, at the end of the evening (just as the amazing Natalie McMaster began to play) I had the chance to meet him when he signed the cookbook I had purchased. I admit I am not much of a cook, but since I am now embarking on a new adventure of my own (new house, single parenthood, and a teenage daughter who likes to eat) I thought perhaps it was time to learn a few things about the kitchen (as opposed to knowing only where the wine opener is and how to turn on the dishwasher). I stood in line and when the time came I chatted with a man who is the genuine article, a professional chef with a huge heart, and one who has, I think, taken this community into that heart. Earlier that night on stage he had commented that he thinks those who judge this community need to come and visit it and learn who we really are, and I could not agree more, of course, since that is what I always say to those who say unkind things about us. They simply don't understand us or know who really are - but I think that Chef Michael does, and I am truly glad to know that he has become an ambassador for us as he goes out into the rest of the world, sharing his story of who and what this community really is. Last night was one of those amazing nights in Fort McMurray, you see. After I spoke to Chef Michael I headed home, too full and suddenly too tired to stay a moment longer. I carried in my hand the book he had signed, autographed to "McMurray Musings", as I had shared with him this blog, and why I write it. It was raining softly, and when I went by the back doors as I headed towards my car I could hear the fiddle music and the sounds of laughter. It was a lovely final moment for me as I reflected not only on the success of the event but on the success of organizations like the Fort McMurray Family Crisis Society. You see these fundraisers are wonderful to attend, but they are the glitzy side of the hard work done every day by the social profit organizations in this community. Most days for the Family Crisis Society don't include famous chefs and fine cuisine and live auctions. Most days are about simply getting the job done, meeting their mandate, doing what needs to be done - and changing lives, like the lives of the people I mentioned at the beginning of this post. The work they do every single day is what keeps some people from tragedy, and they are the glue that puts the broken pieces back together. And so while I am truly and profoundly grateful for last night and a wonderful evening I am in fact far more grateful for the work they do every day, and for the fact that they were there for people I care about when they needed them. This is what the Fort McMurray Family Crisis Society is, you see. It is about being there for those in need, and events like last night give them some of the resources they need to do so. It was a pleasure and honour to be there., not just to eat the food and listen to the music and meet Chef Michel Smith - but to honour and celebrate an organization that makes a difference in our community, every single day.